Words at War: The Civil War and American Journalism analyzes the various ways in which the nation's newspaper editors, reporters, and war correspondents covered the biggest story of their lives-the Civil War-and in doing so both reflected and shaped the responses of their readers. The four sections of the book, Fighting Words, Confederates and Copperheads, The Union Forever, and Continuing Conflict trace the evolving role of the press in the antebellum, wartime, and postwar periods. David B. Sachsman holds the George R. West, Jr. Chair of Excellence in Communication and Public Affairs at the rank of Professor. He came to the University of Tennessee at Chattanooga in August 1991 from California State University, Fullerton, where he had served as Dean and Professor of the School of Communications. Previously, he was Chair of the Department of Journalism and Mass Media at Rutgers University. He is the director of the annual Symposium on the 19th Century Press, the Civil War, and Free Expression, which he and S. Kittrell Rushing founded in 1993. 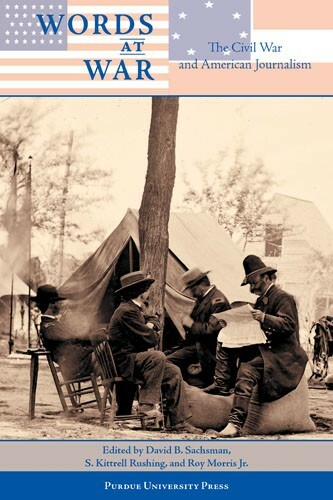 Dr. Sachsman is an editor of The Civil War and the Press, a book of readings drawn from the first five conferences, published by Transaction Publishers in 2000. He also is known for his research and scholarly activities in environmental communication and environmental risk reporting and for the three editions of Media: An Introductory Analysis of American Mass Communications (which he wrote with Peter M. Sandman and David M. Rubin and for which he wrote the history chapter). A journalist by trade, Dr. Sachsman also has written about the suburban press. Three of his books and a series of articles have won statewide awards from the Society of Professional Journalists. In 2005 Dr. Sachsman headed the team appointed to evaluate the U.S. Agency for International Development's environmental education and communication efforts in more than thirty countries across twelve years. Dr. Sachsman received his B.A. in English from the University of Pennsylvania and his M.A. and Ph.D. in Communication from Stanford University. He has been teaching journalism to students and professionals since 1969. In 1974, he worked for The Home News in New Brunswick, N.J. as a copy editor and informal writing coach. In the same year, he served as an educational consultant to the Mass Communications Department at Clark College in Atlanta. From 1996 to 1998, he was a news consultant and writing coach for WRCB-TV in Chattanooga. In 1998, he received the Yale Daily News' Braestrup Fellowship and gave two presentations on journalism ethics at Yale University. In 2003, he delivered the Medart Lecture (on "Mass Media and War") at Maryville University in St. Louis. Dr. Sachsman served as a Senior Fulbright-Hays Scholar in 1978-79 in Nigeria, where he helped plan for the development of one of the first mass communication graduate degrees in West Africa. He was elected president of the New Jersey Professional Chapter of the Society of Professional Journalists in 1981 and served two terms, specializing in continuing education programs for journalists. Roy Morris Jr. is the editor of Military Heritage magazine and the author of four well-received books on the Civil War and post-Civil War eras: Fraud of the Century: Rutherford B. Hayes, Samuel Tilden, and the Stolen Election of 1876 (Simon and Schuster, 2003); The Better Angel: Walt Whitman in the Civil War (Oxford University Press, 2000); Ambrose Bierce: Alone in Bad Company (Crown, 1996); and Sheridan: The Life and Wars of General Phil Sheridan (Crown, 1992). He also edited and wrote the introduction for a popular new edition of Ambrose Bierce's The Devil's Dictionary (Oxford University Press, 1999). His books have been chosen by the History Book Club, Book of the Month Club, Readers Subscription Book Club, and Books on Tape, and all four have been published in paperback. He has been reviewed in the New York Times' Book Review, Wall Street Journal, New Yorker, Atlantic Monthly, Boston Review of Books and New Leader, as well as leading newspapers across the country. Morris has appeared on the prestigious author-interview program, Booknotes, and his speech at the Southern Festival of Books in Nashville in 2003 was carried live on C-SPAN's Book-TV. He has also spoken at the Smithsonian Institution, the National Portrait Gallery and the National Arts Club in New York City. A former newspaper reporter and political correspondent for the Chattanooga News-Free Press and the Chattanooga Times, he was founding editor of America's Civil War magazine, which he edited for 14 years. He has also served as a historical consultant for A&E Network and the History Channel. In 1986, Morris received the annual Author's Prize from Civil War Times Illustrated for best historical article of the year. He is a graduate of the University of Tennessee at Chattanooga, and holds a master's degree in English from the University of Tennessee at Knoxville. He is currently working on a new book for Smithsonian/HarperCollins on the presidential election of 1860, as well as serving as a special projects editor for the University of Tennessee at Chattanooga.